On February 19, 2009, CNBC commentator Rick Santelli delivered a dramatic rant against Obama administration programs to shore up the plunging housing market. Invoking the Founding Fathers and ridiculing "losers" who could not pay their mortgages, Santelli called for "Tea Party" protests. Over the next two years, conservative activists took to the streets and airways, built hundreds of local Tea Party groups, and weighed in with votes and money to help right-wing Republicans win electoral victories in 2010. 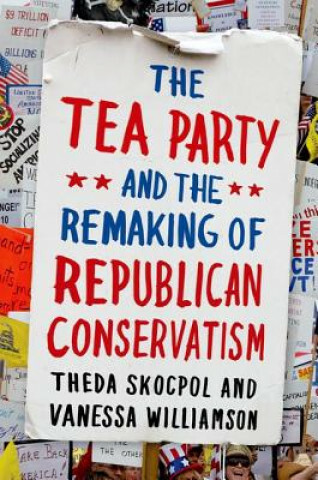 In this penetrating new study, Harvard University's Theda Skocpol and Vanessa Williamson go beyond images of protesters in Colonial costumes to provide a nuanced portrait of the Tea Party. What they find is sometimes surprising. Drawing on grassroots interviews and visits to local meetings in several regions, they find that older, middle-class Tea Partiers mostly approve of Social Security, Medicare, and generous benefits for military veterans. Their opposition to "big government" entails reluctance to pay taxes to help people viewed as undeserving "freeloaders" - including immigrants, lower income earners, and the young. At the national level, Tea Party elites and funders leverage grassroots energy to further longstanding goals such as tax cuts for the wealthy, deregulation of business, and privatization of the very same Social Security and Medicare programs on which many grassroots Tea Partiers depend. Elites and grassroots are nevertheless united in hatred of Barack Obama and determination to push the Republican Party sharply to the right. The Tea Party and the Remaking of Republican Conservatism combines fine-grained portraits of local Tea Party members and chapters with an overarching analysis of the movement's rise, impact, and likely fate. The paperback edition will be updated to bring the discussion up to the present, including the Republican Presidential primary race in early 2012.